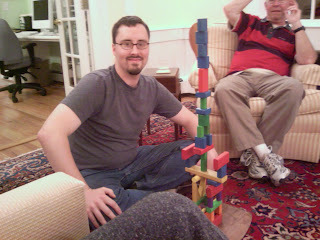 Since my old toys are now Margot's toys at my parents, Daddy got to make an awesome tower of blocks. I mean, it was like, twelve hundred feet tall. Or, three. But very rickety. Margot wasn't that interested while I was building, but became interested once I was done, and dealt with Daddy's creation appropriately. You just wanted to cut the sound level so we wouldn't hear your sobbing. Sorry about your tower.